Everyone loves escaping for a sunny summer vacay but we don’t love the plane flights required to get us to our dream destinations. Crowded airports, long lines and even longer delays can be enough to make you consider bagging the whole thing, cutting your losses and having a staycation. Of course, you’d never really do that, think of all the fun you’d miss! Once you’ve finally made it on board you can breathe a sigh of relief and start the relaxation. Until the person in front of you reclines into your lap as the guy to your left sticks an elbow in your ribs as he takes over your shared armrest and the woman to your right slips off her shoes lowers her tray table and begins to snore. You’re trapped for the next four hours as you look longingly at the rest of your family a few rows ahead. Sure it’s usually only a few hours of discomfort but getting good seats on plane flights can make the difference between spending those hours in misery and spending them getting a head start on much needed R&R. Like everything else these days, getting the best seats is much easier if you’re willing to pay a price but there are lots of ways to improve your chances without shelling out extra cash. First you need to figure out what your priorities are. There’s legroom, window or aisle, access to exits and laptop power. If safety is your main concern, you’ve probably heard that it’s best to sit toward the back of the plane or on an exit row. 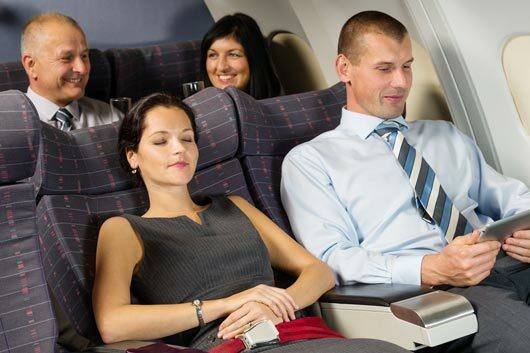 According to FAA research scientist Cynthia Corbett, “There really isn’t a ‘safest seat’ on the plane. It really kind of depends on the emergency you’re going to have. Different parts of the plane can be effected in different ways, depending on what the event is. Just reinforce your own propensity for survival, by knowing how to get where you need to go. If your first choice in exits is blocked, then you should have a second choice.” This may not be particularly comforting but it does give you more seat options.